Hello, everyone! Hope you are enjoying your Labor Day weekend. 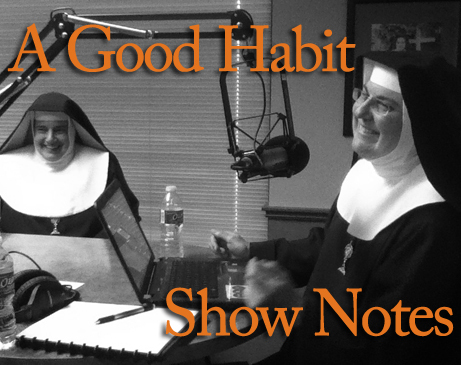 I’ve been neglecting the show notes over the last month, so I want to make sure I get them up for last week’s episode of A Good Habit. Firstly, many of you have let us know that you’re having trouble accessing the podcasts in iTunes. Hopefully that will get fixed soon, but in the mean time we’re going to put it on the blog as well, and hopefully there won’t be any trouble listening. Here is A Good Habit from Wednesday, August 27th, 2014. If you’re interested in going on the EWTN/Shrine of the Most Blessed Sacrament pilgrimage October 7-11 with Ken and Debbie Felder, you can email them at kenDOTdebDOTfelderATattDOTnet. It’s a great opportunity to see the EWTN studios, as well as the Shrine, including the John Paul II Eucharistic Center (which we hope to see some day, too). We spent a lot of time talking about what a great time we had at the Fullness of Truth Conference last weekend here in San Antonio. We met so many people from all over Texas, and although we didn’t actually get a chance to listen to any of the speakers (because we were too busy talking with everyone), we heard lots of good things from the attendees. The next Fullness of Truth conference is in Corpus Christi next month, and it’s their very first Marian conference. The theme of the conference is: Mary: the New Eve, Heaven’s Strategy for Spiritual Warfare. Click here to learn more and get your tickets. They are going to have some fantastic speakers, including Dr. Michael Barber and Dn. Harold Burke-Sivers, – it’s definitely worth your time. And, speaking of St. Augustine and smart people, we wanted to mention that Taylor Marshall is working on his next book, Saint Augustine in 50 Pages: A Quick Layman’s Guide to Augustinianism. It’s a follow up to Thomas Aquinas in 50 Pages, which is available for free at taylormarshall.com Keep him in your prayers as he works on the book. When it’s finished it will be available for free on his website. Don’t you just love stuff that’s free and feeds your soul? This entry was posted in A Good Habit and tagged A Good Habit, Dr. Taylor Marshall, EWTN pilgrimage, Fullness of Truth Conference, podcast, St. Augustine, The Classical Theist by texasnuns. Bookmark the permalink. Thank you for posting the podcast! I am among those who have not been able to access it. I love your posts, always good information including novenas and prayers. Especially appreciated the prayers for our Iraqui brothers and sisters.